Loyola University New Orleans will showcase Cabra Hall’s freshly renovated apartment-style suites today, Sept. 27 at 3:30 p.m. during a dedication and open house event. The 163-bed residence hall, now Loyola’s largest apartment-style community, underwent a $12 million facelift. The five-story property is located at the intersection of St. Charles Avenue and Broadway Street. The open house, part of Loyola’s Family Weekend, will take place at Cabra Hall located on the university’s Broadway campus. The Loyola community can take tours of the updated residence hall as well as enjoy light refreshments and live jazz music from a student duo. As parking is limited, additional shuttles have been added to and from the West Road Garage shuttle stop during this event. 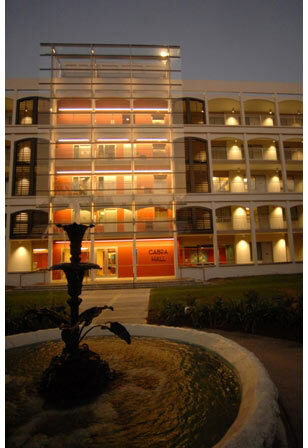 Cabra Hall also includes new green building features such as low-flow water fixtures, energy efficient appliances, digital thermostats to conserve on air conditioning and auto-shutoff lighting in many spaces. The building also features dedicated recycling areas on each floor and a new, covered bike rack. A private fitness center boasting five cardio machines, one strength machine, and yoga mats and balls was added to the residence hall. For safety and security, the residence hall also features exterior cameras, new blue light call boxes for emergencies and high-security locks on all doors. Cabra Hall has been a fixture of Loyola’s Broadway Campus since it was acquired from St. Mary’s Dominican College in 1984. The residence hall closed in May 2012 to undergo its first major renovation and re-opened for the 2013-14 academic year.